Hanging Lake near Glenwood Springs, Colorado is a fascinating place to see, high in the mountains, at the end of a hike along Deadhorse Creek and through rocky canyons. Hanging Lake Colorado is a 1.5-acre lake, fed by water over the Bridal Veil Falls, nestled in the Rocky Mountain wilderness. A short hike takes you to this beautiful spot, but be prepared for a steep climb. 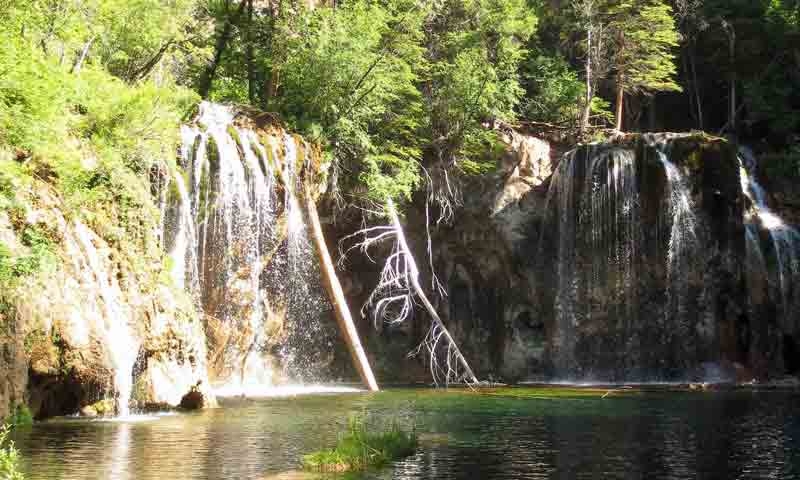 Hanging Lake is approximately 7 miles east of Glenwood Springs and the trailhead to reach the lake is just off of I-70. If driving east on I-70, simply take exit 125 and you’ll find the trailhead at the end of the bike path from Hanging Lake Rest Stop. If driving west on I-70 (coming from Denver), you’ll have to exit at the Grizzly Creek Rest Area and turn around, getting back on I-70 East and exiting at the exit marked Hanging Lake. Hanging Lake Glenwood Springs is best visited from late March through early December. You should always check snow and weather conditions before attempting the hike to the lake in the winter months. Hanging Lake Glenwood Canyon is a beautiful place to visit, with the lake edge unique, built up from flowing water that deposits dissolved carbonates. The Hanging Lake hike is part of the fun. Although steep, it’s only a 1.2-mile trek, and well worth the effort. Always bring at least one liter of water per hiker, more on hot days. The hike on this maintained trail takes you along Deadhorse Creek and through the canyon of the same name. Many switchbacks make it less difficult. As you go, you’ll discover facilities and a picnic area close to where the Colorado River and Deadhorse Creek meet. You’ll know you are close to the lake when you reach the boardwalk. This runs around the lake, and staying on it ensures the fragile ecosystem will remain intact. Now you’ll see this crystal clear lake with its many colors. Watch trout swim even twenty feet out. Follow the boardwalk and stop to admire the waterfalls, which feeds this mountain lake. Take some photos! They will bring back pleasant memories for years to come. When you leave Hanging Lake, you’ll not want to miss visiting Spouting Rock. As you head out, you’ll see a sign on the right, and can take the short trail to a waterfall that spouts right from the cliff face. Please note that swimming and fishing are not allowed in the lake as it disrupts the deposits and harms the natural beauty of the lake. According to early stories, a man was searching for gold in the area when he found a dead horse where a canyon began. This could well be where the name Deadhorse Creek Canyon originated. He followed the canyon through the steep hills and came upon this unusual Hanging Lake.